I was feeling like I needed to make something Japanese probably due to the fact my other half is in Nozawa Onsen, Japan. The lucky duck is enjoying a skiing trip with the lads but not to worry I'm planning a shopping and eating trip to even the score. With chicken thighs in the fridge, I thought this would be a quick and easy meal to make. Plus there's the added bonus that the kids love it too. The ponzu dressing is so easy and I love the citrus notes especially as limes are in season at the moment. 1. Make the ponzu dressing first, add the lime, lemon juice, mirin, soy and stir well. 2. Season chicken thighs well with salt and freshly ground black pepper. 3. Heat the oil in a frying pan over high heat. 4. Add chicken (if you use with skin, then skin side first) and cook for 3-4 minutes (or until skin is golden and crispy). 5. Turn chicken over, and cook for another 3-5 minutes until chicken is cooked through. 6. Slice the chicken and arrange on serving plate. 7. 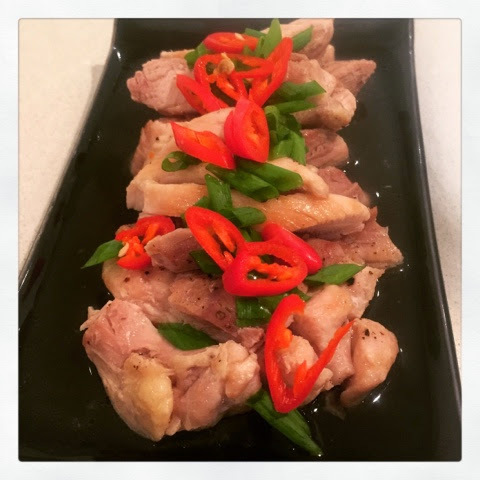 Drizzle ponzu dressing, sprinkle the sliced chicken with spring onion and chilli. If you like crispy skin then I recommend that you put a smaller pan on top of the chicken to weigh it down which will help with that.